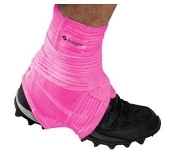 Football players all over the world support breast cancer awareness every October by wearing pink gloves, socks, wrist bands, spats, laces and more football gear! 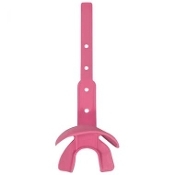 As with most things, the pink trend was originated by the NFL when it began its “A Crucial Catch” campaign. 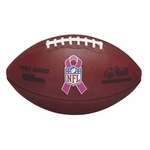 The NFL donates 100% of it's proceeds from sales of pink products to the American Cancer Society so it truly is a great cause. Many manufacturers joined the fight themselves by donating portions of their sales to charities supporting breast cancer awareness and research. Shortly after NFL players began wearing pink football gear, you can find players at every level of football sporting their pink gear in support of the great cause. It has become a trend and widely accepted as the norm, that every October players will be wearing something pink not only to support the fight but to look great as well! Even the most old school coaches can be found wearing something pink in their wardrobe on gameday in October! Look like your NFL idol and select from the wide variety of pink football equipment that we make available here at Endzone Sports. Whether you need a skull cap, laces, tape or pink uniforms we have everything you need to show your support in any way you see fit. 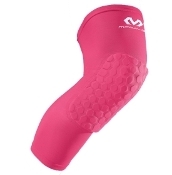 Support the cause and go pink this October with Endzone Sports.